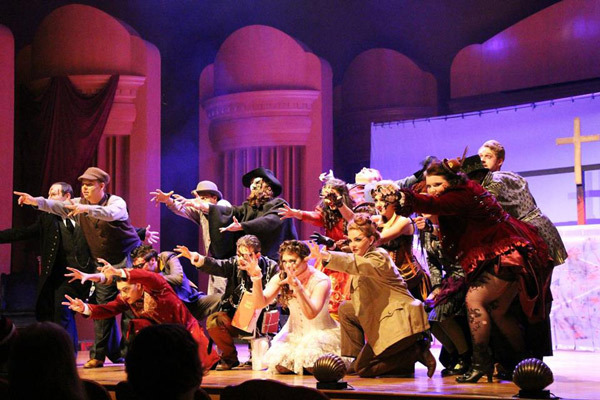 Reinhardt University’s School of Performing Arts faculty will host a musical theatre summer camp for rising high school freshmen through recent high school graduates in July. Performing Arts students perform “The Mystery of Edwin Drood” during the Convocation of Artists and Scholars during spring semester. In its first year, the camp is geared at providing collegiate level training to those interested in the performing arts. The camp, led by music instructor Brian Osborne, will include training in vocals and acting, with a final cabaret performance at the Falany Performing Arts Center. The camp will include instruction by Reinhardt University voice and theatre faculty: David Nisbet, acting and musical theatre; Stewart Hawley, acting; Morgan Brooks, technical theatre; Tiffany Tindall, dance; Dr. Rebecca Salter, voice; Dr. Cory Schantz, voice; Dr. Anne Schantz, voice; and Brian Osborne, vocal coach and music director. The day camp will be held July 25-30, from 10 a.m. to 6 p.m., on the campus of Reinhardt University in Waleska. Tuition for the camp is $395 per student, which will help fund a new theater for the School of Performing Arts on Reinhardt’s campus. Students are encouraged to bring a lunch or they can choose to dine at the University’s Gordy Dining Hall. For more information or to register, contact Osborne at BSO@Reinhardt.edu or (405) 795-4107.